As part of a wider transformation, Forum for the Future chose IE Brand to rebrand the charity. Forum for the Future is a leading sustainability non-profit, leading a global community of over 130 organisations. They needed a brand to reflect this reach, and help them to connect emotionally with their audiences. IE Brand created Forum for the Future’s new brand messaging and visual identity, plus a sub-brand for the new School of System Change. 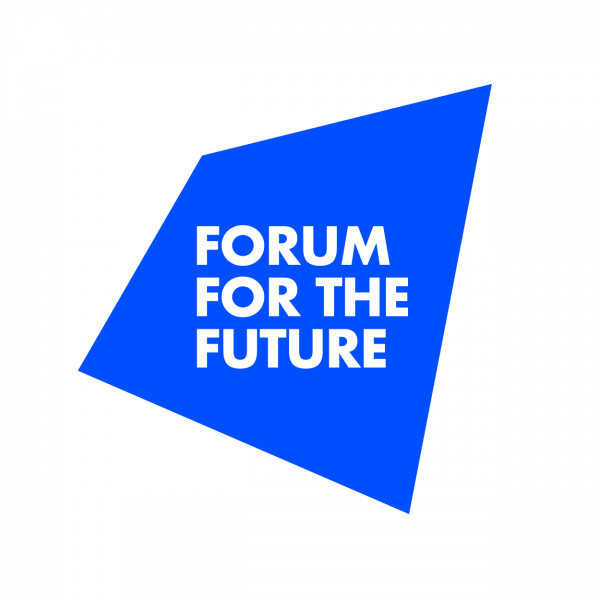 The new logo is a window into the future – to a world that’s been positively transformed by Forum for the Future’s actions. Forum for the Future collaborates with businesses, governments, and civil society to drive Systems Change: solving complex sustainability challenges by understanding how key systems can fail, and how we can effect positive change. Increased competition, threatened Forum’s position as leaders in system change. They were also moving to a more diversified funding model, becoming more reliant on trusts and foundations, so needed to articulate their work more clearly. At an exciting time for Forum that included a significant operational transformation and restructure, Forum for the Future chose IE Brand to create a new brand, to project a renewed sense of organisational confidence. The charity wanted a cohesive brand to reflect their international reach and knowledge, and speak to organisations across their core geographies: the UK, the US, the APac region and India. They were also building the School of System Change, a global community of Systems Change Agents working to accelerate towards a sustainable future. They needed a distinctive identity to position the School at the cutting edge of learning for system change for sustainability. We supplemented Forum’s existing insights with further audience research, surveying people from within the charity, their retail partners and key contributors from other sustainability non-profits. These stakeholders helped us to understand Forum’s strengths, weaknesses, opportunities and threats. They also gave us valuable insights into the organisation’s personality and what makes them unique. At its heart, we found Forum for the Future to be a trusted but challenging friend, with a passion and commitment to solving complex sustainability challenges through a partner approach. For over 20 years, they’ve been a pioneering catalyst for change, trying to solve society’s greatest challenges where others have turned away. They’re a fascinating organisation, but they looked and sounded a lot less interesting than they really are. IE Brand helped Forum for the Future to bring renewed energy to our work by creating a distinctive new visual identity that beautifully represents our values, and truly reflects our ambitious vision for a sustainable future. Our funders and partners have commented on how the new look and feel is fresh, dynamic and really encapsulates what we’re trying to achieve. Forum for the Future recognised that as a diverse and complex organisation they needed to articulate their story much more clearly. They had developed their own vocabulary, which made them hard to understand. IE’s advice was *not* to help audiences to understand these many levels of complexity – but to remove them from the narrative completely. Forum needed to strip out the jargon, speak more plainly and become much more accessible to any audience – be they members, partners or funders. The brand was also in danger of becoming fragmented, so we teased out the fundamentals of the organisation, to get to the heart of the brand. A strong, distinctive parent brand, can then flex for different regions, projects and audiences. We also advised Forum to give greater visibility to the stories behind their projects – such as Tea 2030 or Cotton 2040 – to bring the brand to life and stand out from the crowd. IE set about crafting the new Forum for the Future brand, and an exemplar sub-brand for the School of System Change. IE positioned Forum for the Future as agents of change. Our copywriters honed the brand’s core beliefs, tone of voice and marketing messages, while our brand designers crafted a new visual identity. One to encourage people to join Forum in their ambitious mission. Bold and brave, the new brand breaks the mould to avoid looking like a typical ‘sustainability’ organisation. It paints a truthful picture of a world facing significant challenges – but one that’s far from a lost cause. The new logo is a window into the future – a window to a world that’s been positively transformed by Forum for the Future’s actions. The School of System Change is a centre for learning and experimentation, home to training and development programmes such as the Masters in Leadership for Sustainable Development. The School is nurtured by Forum for the Future alongside other partners, so the new brand needed to reflect this relationship. It needed to appeal across the School’s target audiences, including Systems Change Agents looking to learn and grow as professionals, Contributors to the School who already work in system change, and the wider audience for Forum for the Future. IE created an identity that’s strongly connected to the parent brand, but without it seeming too ‘owned’ by it. The visual identity brings the School to life as a network of collaborators and contributors, connecting the dots between elements of a system to bring about change. The School’s messaging is crafted to awaken the inner campaigner – inspirational individuals who are restless for change, and excited about the opportunities open to them. We created a full suite of logos and icons, as well as templates for an array of uses including: posters, emails, presentations, and a prospectus for the School. We also demonstrated how the brand could adapt brilliantly to the new website, video assets and social media platforms. Finally, IE created a set of online style guides in the Frontify platform, to help Forum for the Future to manage the new School of System Change brand, and police its use by other partner organisations. The distinctive sub-identity IE created for our School of System Change is also spot-on, reflecting the experimental and inclusive nature of our work to build a global community of system change practitioners – we're delighted!